My masterpiece - family together on Christmas Day, with Love. 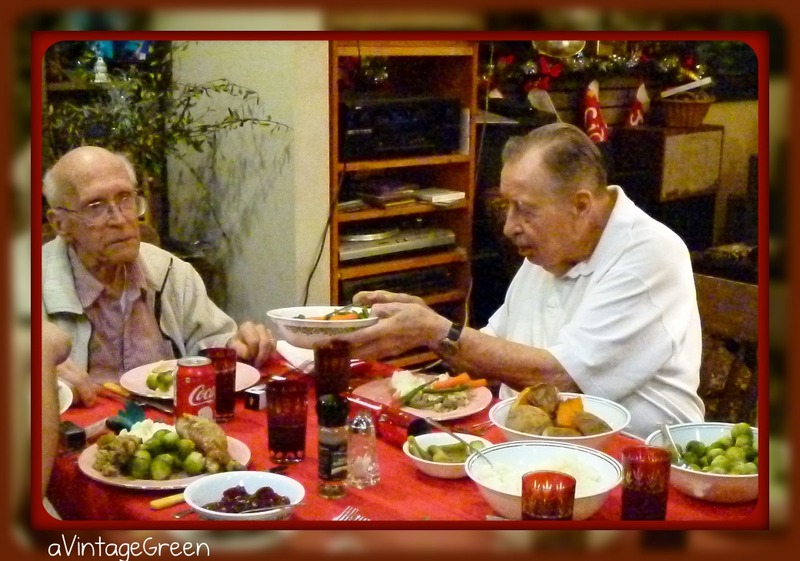 The Granddads from both sides of the family joined us for Christmas dinner this year. They are 90 and 91 and have quite a bit in common, WWII, the Great Depression, raising families on very little, comparing hip surgeries, their lives today, tallying their children and grandchildren and great grandchildren. After visiting, dinner, tea and dessert and more visiting DS drove the paternal Grandpa home, taking him on a 'looking at Christmas lights' tour on the way and I drove my Dad home, taking him on a tour of the brightest Christmas lights around town. We all enjoyed ourselves. DH did a great job with the turkey, dressing and gravy, I did vegetables, DS carved and did the potatoes and whipped cream. I cleaned up (my pretty dishes, my choice). I am linking to Coloradolady: Vintage Thingie Thursday, Thrift Share Monday with Apron Thrift Girl and Nifty Thrifty Tuesday No. 94 with Coastal Charm. My table setting is mostly thrifted. The beautiful red cut glass glasses are estate sale finds as are the pink Royal Winton dinner plates. The serving dishes are all garage sale, the knives are garage sale and the christmas poppers (unopened, as new) are garage sale finds as well. The pink plates and red glasses are treasures I bring out only on special occasions. Even the salt shaker is thrifted. A charming scene, Christmas as it should be. love those red glasses! great festive pieces! the picture of the 2 dads/granddads is a very special one! i love that generation so much. Thanks for being so giving and caring it means a lot. I wish I'd been a fly on the wall! My Dad is 94 and I love to hear all about his life. Glad you has such a blessed Christmas! I, too, enjoyed the photos of your Dads. My husband's and mine are gone now so enjoy yours, every moment you can. If mine were back, I'd have the patience of a Saint and listen to each and every story again. and again. Merry belated Christmas and Happy New Year. I enjoy your posts. Keep up the good work! oh my gosh your photos of the grandads is priceless. i am your newest fan. please give those cute old guys a kiss from me! Love the table! Saw you on Apron Thrift Girl. What a nice family you have! Lovely family times--cherished for sure. That turkey looks mighty good. Have a great and happy New Year! Hi. I'm a new follower and I wanted to comment. I always love seeing family pictures after my own nana's death it means a lot to me to see memories such as these. Thanks for sharing your Dad and father in law with us...God bless them. You are very blessed to have your grandparents! Mine have all passed away. Your setting is lovely! I always have crackers, even if it's just the 2 of us! LOL! 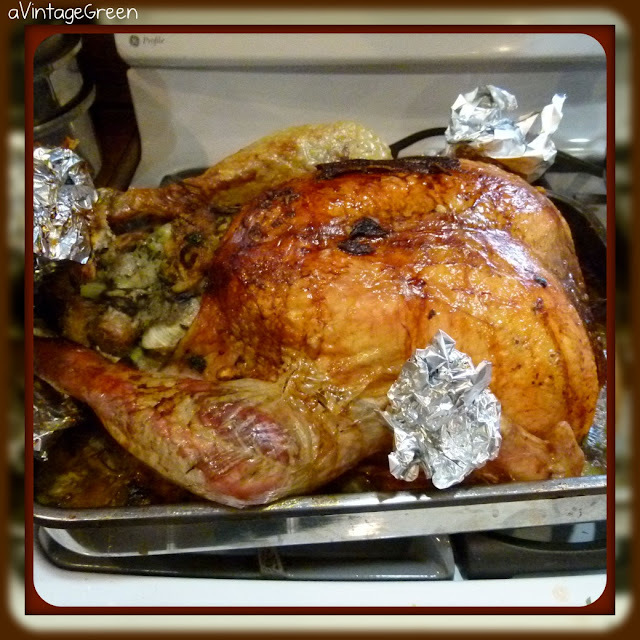 The turkey looks scrumptious! 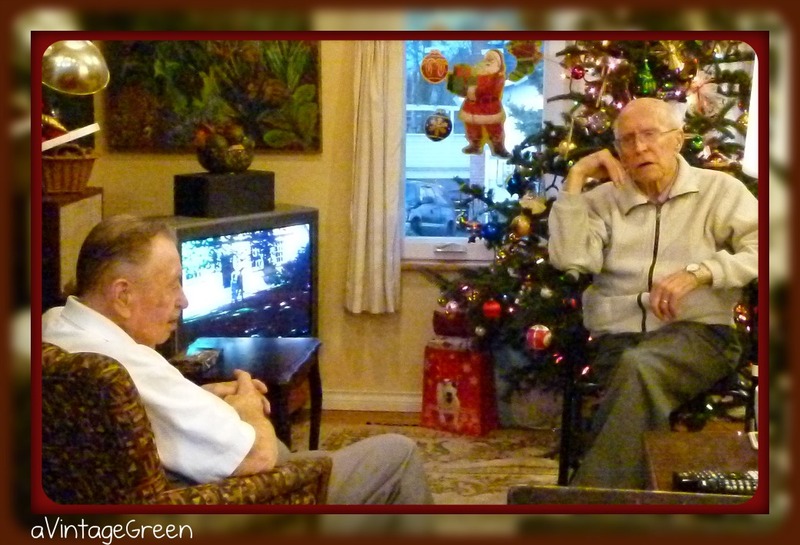 What a wonderful Christmas and fond memories you made with the older gentlemen. I am sure they were very pleased.Most of the time, the seniors get pushed to the back of the bus so to speak. Oh, thank you for your lovely post. I lost my daddy this year at 92 and reading your post brought back lots of lovely holiday memories for me. Happy New Year to you and those dear to you! You have a wonderful eye for a bargain. 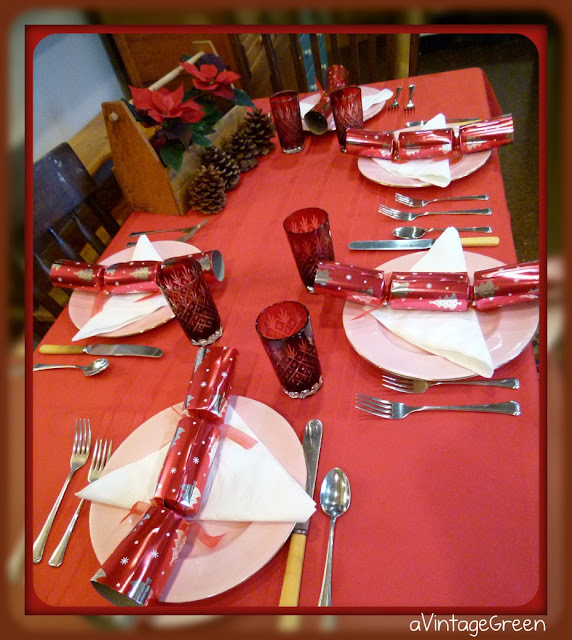 Your vintage table setting is beautiful and so were your vintage guests. Your table is just lovely! It looks like you had a wonderful day with family!! Happy VTT!